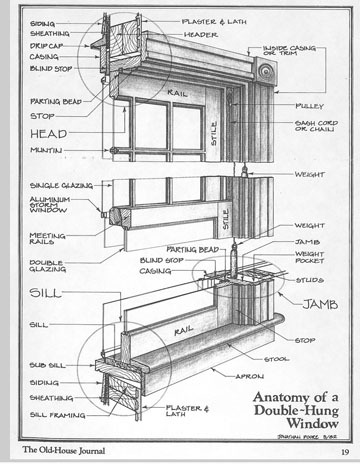 DIAGRAM of a wood window—built to last, not land in a landfill. While new windows might be tempting with their slick surfaces and “green” marketing campaigns, think hard before throwing your old windows, well… out the window. If you live in an historic zone, you may not have a choice if it’s on the façade of your house. But this could be a good thing. Wood windows made prior to 1940 are from old growth wood, which is more dense and rot-resistant than the newer varieties from tree-farmed softwoods, or the simulated plastic versions. Don’t take our word for it. The New England Window Restoration Alliance lists “Top 10 reasons to restore or repair your wood windows” (see below). As “quirky as they might be,” according to reason #1, “your older windows fit your house.” Windows and their original openings change shape over time, but they do so together, and like a good marriage, they fit. If a newer stock replacement window is installed, while it might look good initially, over time, gaps lead to drafts, compensated for by reducing the overall size of the opening and reducing light. Homes built pre-1950 had thicker walls and the older windows were designed for them. The newer varieties are made for thinner construction techniques. It’s a misconception to blame windows when loss of heat is a concern. It’s mostly through the roof, as heat rises, says Mary Pickhardt, an architect appointed by the city to the Windsor Square Association Historic Preservation Overlay Zone board. Rather than replace the windows, insulate the attic. “That’s one of the most effective things you can do,” she said. Residents submit proposed renovation plans that affect the street facing facades of the home to the Planning Dept., whose staff determines if the project needs HPOZ Board review. “We’re pretty adamant about it,” she says. While built to last, they need a little TLC now and again. A good carpenter can restore an old sash— the operable part of the window. Homeowners could place vinyl or other newer styles in the back. However, the overall integrity of the home is compromised. And vinyl is turning out to be an environmental nightmare, from its production to the gasses it emits over time, and can’t be recycled. “If you are concerned about our planet’s health, read up on efforts to reduce the use of vinyl,” in the Top 10 reasons. Speaking of the environment, unlike new windows, which are sold as a unit, wood windows can be repaired in pieces. This is a much more sustainable practice than having to replace the entire unit and reframe and re-seal the opening. If the window can’t be saved, there are several local companies that replicate the originals. But usually even with minimal maintenance older windows can be restored to look and work like new. After all, “windows are one of the most beautiful design features of the house,” says Pickhardt. 1) Your windows fit your house. 2) You appreciate good craftsmanship. 3) You value good materials. 4) You love the character of antique glass. 5) You think a warranty should be more than 20 years. 6) You want to avoid vinyl. 7) You want more light. 8) Windows are a functional part of your house. 9) You really can save 30-40 percent on heating costs. 10) The greenest building is one that is already built. From the New England Window Restoration Alliance. Ken Bernstein manager of Office of Historic Resources and principal city planner of Policy Planning, suggests “Caring for Your Historic Home” booklet. The window entry starts on page 12 and gives step-by-step instructions on fixing broken glass and other repairs and tips. The PDF version is available at preservation.lacity.org/files/HPOZ%20Rehabilitation%20Guide_0.pdf. Copies are available in Room 601 of City Hall. The National Trust for Historic Preservation has several web links and publications at see www.preservationnation.org/information-center/sustainable-communipties/buildings/weatherization/windows/.